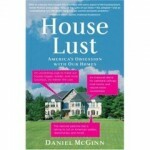 I recently had a chance to talk to Daniel McGinn, author of the hugely entertaining new book House Lust. 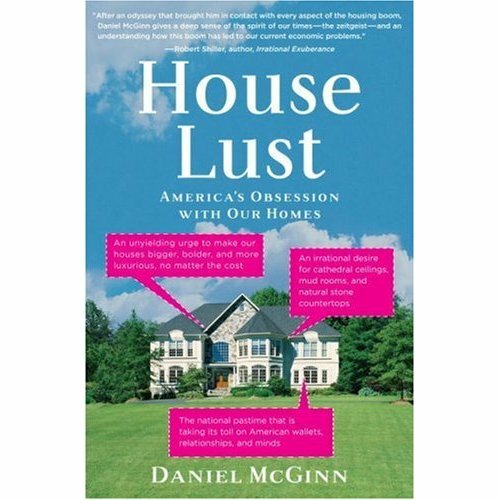 Listen in on our conversation to hear what he has to say about the future of McMansions, the phenomenon of “new-house” lust that causes buyers to spurn “used real estate,” and how the housing boom may have permanently altered the way we think about our homes, even after it’s gone bust. Q: What inspired you to write about house lust? A: I’d reported on homes and real estate over the years for Newsweek, and I’d seen how passionate (and at times, excessive) people could get about home-related decisions. My wife and I had also bought our first home in Massachusetts just as the real estate boom was starting, so I’d seen firsthand how many dinner parties devolved into real estate gossip, agonized over our own renovations, watched a lot of HGTV. As the book makes clear, while I do a lot of reporting on people who are obsessed with houses, I certainly share some of this passion myself. Q: Now that you’ve been inducted into the world of around-the-clock home-improvement television, have you found yourself watching more of it yourself? Chapter Four of HOUSE LUST, in which I explore the rise of these shows, is one of my favorites; I really do think that these shows are an under-explored and under-appreciated factor in what’s driven a lot of people to become such perfectionists when it comes to homes. I watched a lot of these shows over the years; my favorite, by far, is “This Old House.” I actually stopped watching HGTV altogether while working on the book, since watching it felt too much like work and was a reminder that the time I was spending watching TV should really be spent working on the book. However, last week I was flying on JetBlue late at night and I watched a bunch of HGTV shows back to back. I still do find it entertaining. Q: What role do you think HGTV has played in America’s growing obsession with real estate? Do you think it just reflects what’s going on in the country or is it actively contributing to it? My first reaction to the real estate shows on HGTV (like “House Hunters”) is that it’s kind of amazing that someone could figure out how to make successful shows out of something so prosaic. And, as the book makes clear, some of HGTV’s producers are surprised at this, themselves! But you’re right: I do think these shows are not just a side effect of our obsession with homes, but have helped to fuel it in certain ways. This isn’t the only factor, of course: if you think about it, back when my parents were fixing up the house I grew up in, there was no such thing as Home Depot, so if you wanted to buy a new sink, your choice was pretty limited to what was in the hardware store, and it was hard to obsess over these choices. But I do think that HGTV has helped get a lot of people excited about renovating and making over spaces, and to the extent that this helped drive spending during the boom, I do think it was one of the drivers. Q: I enjoyed the reporting you did from Nevada (Chapter 4: “That New-House Smell”) where you investigated new-house lust. Do you think the rest of the nation is going to follow Nevada’s lead in this and everyone will want new construction eventually, or will that be another thing that “stays in Vegas”? 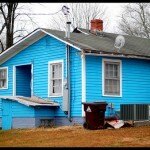 This was pretty foreign to me, since I’ve lived mostly on the East Coast where homes tend to be older. I grew up in a house built in 1929, and now live in a home built in 1972. I think that people’s preference for new homes, particularly out west where there’s lots of land, is partly a result of how effectively the building industry has marketed its wares. Their model homes, design studios (where you choose options) and sales people have been very effective at communicating the idea that people will be happier if they buy a new space built exactly to their specs, where they’ve chosen everything in it. I do think that the end of the boom has dampened people’s desire for these homes, since they’ve lost a lot of value, but that some of this lust for new construction will remain. 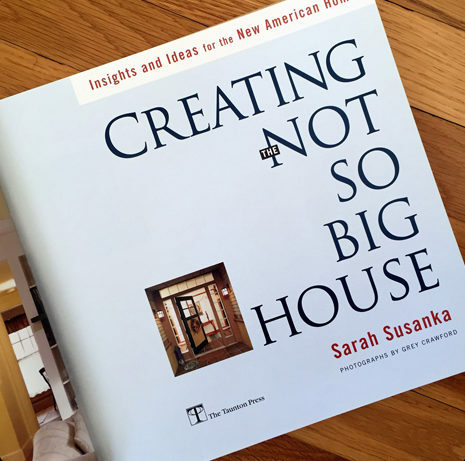 Q: I’m a fan of the Not So Big House books by Sarah Susanka, so I was pretty excited that you included her in your book. Do you see any end in sight for the McMansions? Will the end of the housing boom finally bring an end to the “bigger is better” mentality and make people rediscover the value in smaller homes that are better built? People have been predicting the end of McMansions for some time, and apart from the housing meltdown, there hasn’t been much sign of it happening. I think the end of the boom will certainly have people thinking harder about how much money they want to spend on a home, and that will indirectly lead people to rethink some of the bigger-is-better mentality. I like a lot of Susanka’s theories myself, but I’m not sure that some of her basic messages — that cathedral ceilings often don’t make sense, that we’d be better off without formal dining rooms–have evolved to the point where they really resonate with the masses yet. My house doesn’t have a formal dining room, but my friends still seem to enjoy theirs quite a bit, and I suspect if we went to sell our house, the lack of a formal dining room would be seen as a negative. I’m not sure the smaller-is-better message yet has that much widespread appeal. Q: I had to laugh at the story about the rental property you bought in Idaho sight-unseen. Do you still have it? How’s that working out for you? Yes, I still have the Idaho property. I have a new property manager who’s been really, really good, but there are still a fair share of headaches. In December there was a dispute over a property line (one of my tenants put a shed on someone else’s property that had to be moved), and I just had to replace the electrical panel. The ironic part is that on paper (key words! ), it’s performed reasonably well as an investment: it’s appreciated by about 10 percent in the year I’ve owned it, and the tax implications have been bigger than I’d expected. It’s definitely a piece of HOUSE LUST that’s gotten a lot of comment, though, and my wife still isn’t so wild about our Idaho investment. Q: I scored alarmingly high on your “Do you have house lust?” questionnaire. Is there any hope for me? Or is this one of those conditions that can be managed, but not cured? I think the thing you have to keep telling yourself is that your house is mostly an expense, not an investment, even if you hope it will gain value over time. So long as you scrutinize whatever improvements you plan to do, making sure that you’re not getting too wrapped up in what they’ll do for the home’s value and that you realize most of the benefit you get from your house will be the enjoyment you get from living there, and so long as you can definitely afford whatever you do, you’ll be okay. There are certainly worse conditions to have than house lust! Q: Do you think the end of the housing boom will cool our lust for houses? Will we lose interest now that they’re no longer making us rich? Or is there no going back to those innocent days when we wallpapered our rooms with abandon, giving no thought to how it would affect the resale? I think House Lust will recede, but it won’t go away altogether. Ratings for HGTV are higher than ever. So is traffic at Zillow. I think people’s ability to trade up to new homes or refinance existing ones to pay for further improvements has been seriously crimped by the real estate bust, but I do think there’s something transformative about having lived through a few years in which everyone seemed to think their house was going to make them rich. I’ve compared it to the dot-com boom: before 1995, if you told someone you were quitting a good job at IBM or GE to join a startup and were taking a pay cut in return for stock options, they would have thought you were crazy. The dot-com boom ended with the tech bust, but even today, a lot of people think it’s very cool to work at places like Google or Facebook. Similarly, I think our generation, having lived through the housing boom, will think about the value of our homes more strategically than our parents did: making improvements, refinancing, trading up when appropriate, etc. So I think much of this will live on. Many thanks to Daniel McGinn for taking the time to talk to us today! 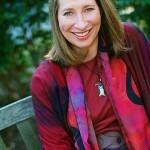 You can buy his book here and read Sarah Susanka’s thoughts on the subject that she shared with us here. I just bought the book this afternoon and will take it on my trip to AZ next week, if I can wait that is. I’ll let you know what I think. Great! Hope you enjoy it as much as I did, Janet–and have a good trip! 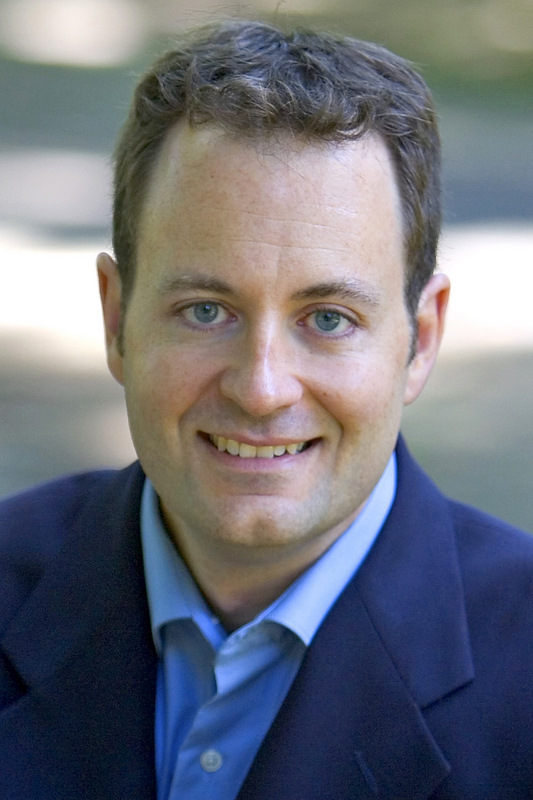 A BIG THANKS to Dan McGinn for taking the time to answer my questions today when he could’ve been, all, “Sorry, I’m too busy being interviewed on NPR and signing books.” His kindness to this humble blogger is much appreciated.